One of the most historically significant routes in the Potteries is Westport Road in Burslem, which links the Mother Town with Brownhills, just south of Tunstall, the route once being busy with export wagons en route to Liverpool (and on to the rest of the world) and the North. next: The end of an era? Back in the 18th and 19th centuries, Westport Road was known variously Sytch Brook and Liverpool Road, but the community that developed was always referred to as ‘the Sytch’, and was renowned for hard, edgy industry with potbanks, furnaces and flint grinding mills belching filth and fumes into the sky. It was a community that its people wished to disown – it is said that many would not admit that their address was the Sytch – and its sludge, smoke and slime were legendary. Historian Paul Johnson who beautifully and memorably recalled his childhood in the 1930s Potteries in The Vanished Landscape, described the Sytch as “the dark heart of the Potteries”, and opined that Scotia Brook, which passes through the Sytch, was “probably the most polluted stream in Britain for a century or more, perhaps the world”. Johnson’s lively description of the area paints a picture in my mind’s eye of the kind of images often seen on TV documentaries about volcanoes, with lava flowing and crashing, sending forth fire, ashes and unbearable heat, a permanent Bonfire Night. It has been suggested that Johnson’s memory plays tricks on him though, and that the view that he recalls from his formative years was actually of Goldendale from Tunstall; it is possible that this is accurate. The Sytch was a typical Potteries community: small workers’ cottages lining the streets, cheek by jowl with potbanks, tileworks, and foundries; people didn’t need cars or public transport – never mind that they would not have afforded them, even if available – employment was within walking distance, as were all the other services and facilities that help to form a community. Indeed, if it were not for the filth and the scum, you would probably have had the Holy Grail of a ‘sustainable community’ that the politicians, planners and architects of today continue to search for. The area was dominated by four major landmarks: Enoch Wood’s Fountain Place Works, the Hill Pottery (rebuilt in 1839 for Samuel Alcock), the Hill Top Methodist Church (which became the Burslem Sunday School), and the Hill Works. The Fountain Place Works was built in 1789 and dominated the western edge of Burslem, and was an architectural hybrid of Palladian and Gothic styles, a very unusual combination for the time. The frontage of Woods factory in 1840.
coal from the firm's colliery at Bycars. Pack Horse Lane was entered through the arch. On the opposite side of the road, heading towards the heart of the Sytch was the spectacular Hill Pottery. This was arguably one of the finest architectural statements of the pottery industry, described by Ward in The Borough of Stoke-on-Trent as “the most striking and ornamental object of its kind within the precincts of the borough”, with the main entrance exhibiting what was becoming the ‘traditional’ Venetian window with pediment above, an approach reflecting other manufactories such as Longton’s Boundary Works, and the neighbouring Wade Heath Pottery. Ian Nairn, the respected architectural critic, considered that the Hill Pottery was “the most spectacular building in Burslem, even in decay”, but it was shamelessly neglected until it fell into such a state of disrepair that demolition was the only option. Further into the heart of the Sytch stood the Burslem Sunday School, built in 1837 by Samuel Parch as the Hill Top Methodist Church. Described by Pevsner as “very monumental for a chapel of that date”, it became a very popular facility with locals due its educational offer, which was considered an important social tool at a time of rising crime and hooliganism. The building was Listed at Grade II in 1972, but was the victim of a terrible fire in the 1980s. Today, just the ruined eight-columned portico remains. To the right can be seen the side of Wade's Hill Top works. A neighbour of the Hill Top Methodist Church was the Hill Works, built in 1814 by John and Richard Riley, replicating the corner plan and arched coach entrance of Enoch Wood’s Fountain Place Works, and displaying the customary Venetian façade. As with the Methodist Church, Pevsner was impressed, considering it to be “one of the best pottery offices and warehouses”. Wade Heath and Co. occupied the building from 1954, and the Hill Works still remains – becoming a Grade II Listed Building in 1993 – largely unaltered (though local highway engineers would love it to disappear) as you approach the valley below. The Sytch continued to be a gritty industrial community until the 1960s, when new Utopian planning philosophies began to dominate our urban landscapes: post-war Government intended to rid our town and cities of the ‘slums’ that the Industrial Revolution bred, and set out on huge clearance programmes, and the exodus from inner urban areas continued from the inter-war period ‘Homes for Heroes’ campaign, with families displaced and sent to distant semi-rural municipal estates, in the case of Burslem communities, Stanfields, Chell Heath and Norton-in-the-Moors. Indeed, by the late 1960s the vast majority of the Sytch had been swept away. A trip down Westport Road from Burslem Town Centre today is a completely different experience. Long gone is the dense industrial community of the 19th and early 20th centuries, and so is the grime and the smog that dominated the atmosphere, overcame local people, and blackened the fine buildings of the Mother Town. All that remains of Enoch Wood’s spectacular Fountain Place Works is the main entrance block, which was restored and converted to town centre living accommodation in 2000, while the Hill Pottery disappeared from the landscape years ago. 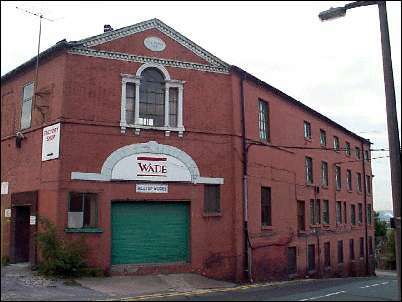 The Hill Works is now empty and awaiting new life following the decision by Wades to move to a new purpose-built factory in Etruria Valley, part funded by a ‘regeneration’ agency. 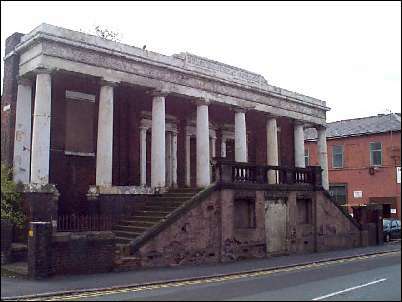 But the one abiding image of what once was is that of the Burslem Sunday School portico: a lone ghostly structure, like a mysterious and silent ruin of a lost world, a vanished civilization, comparable to the crumbling Mayan temples of Mexico. 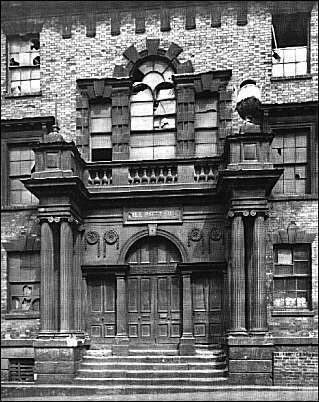 Fountain Place Works, the Sunday School portico, the Hill Works. All relics of a bygone age.